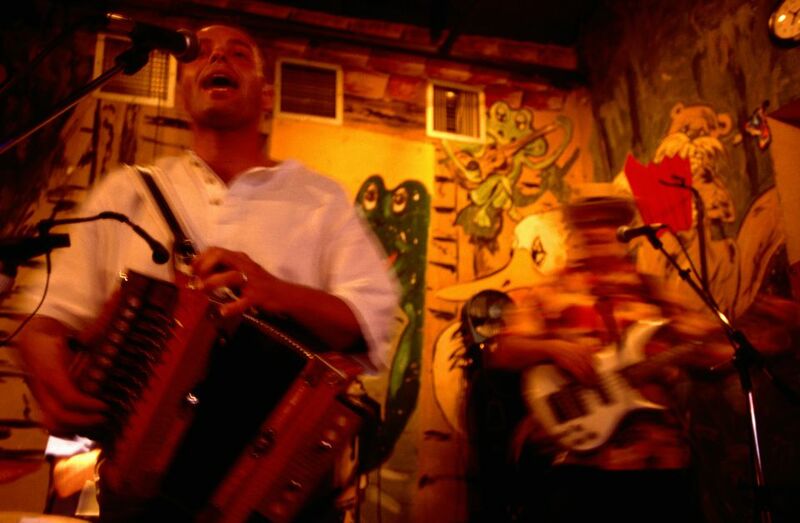 Though Cajun and zydeco music are not native to New Orleans (they're rooted in Acadiana, the area around Lafayette), they've made a solid and lasting impression on the Big Easy's musical scene. You'll see lots of Cajun and zydeco bands at all of the major New Orleans festivals, including Jazz Fest, the French Quarter Festival, and (obviously) the Cajun-Zydeco Festival. There are also plenty of good Cajun and zydeco bands playing throughout the city on any given week, so no matter when you visit, you should be able to find an excellent band that'll have you waltzing and two-stepping around the floor for hours. It's okay to just sit in the back and watch, too. Just don't be too surprised if a friendly local drags you to the floor at some point. Follow their lead; you'll be fine. Pick up a copy of OffBeat Magazine or The Gambit at any newsstand as soon as you arrive in town, or tune your radio dial to WWOZ at 90.7 FM, and check out the concert listings. Keep an eye out for these excellent venues, which are likely to have Cajun and zydeco music on the docket. Mid-City Lanes is a one-of-a-kind venue which combines bowling, food, and live bands for an experience that you won't replicate anywhere else. The music on offer is diverse, but Cajun and zydeco both make the roster at least once a week (Thursdays almost always, and sometimes on the weekend as well), and the bands on the stage are among the biggest names in the scene: Geno Delafose & French Rockin' Boogie, Chubby Carrier, Rockin' Dopsie Jr. and the Zydeco Twisters, Steve Riley & the Mamou Playboys, Keith Frank & the Soileau Zydeco Band, and so on. It's a great place to dance (and bowl, if you're so inclined) and absolutely worth seeking out. This venerable music club features both New Orleans' finest performers from across the genre spectrum and well-known touring bands. Every other Sunday, though, Tip's hosts a Cajun Fais-Do-Do (a fancy word for a dance). The Fais-Do-Do usually features the excellent Bruce Daigrepont Cajun Band, and if Bruce is on tour, another worthy group always takes his place. These shows are wildly popular among local Cajun dancers, so if you want to see the real thing on the dance floor (and perhaps have a waltz or two yourself), swing by. Originally an offshoot of the now-defunct Mulate's Cajun Restaurant in the small Acadiana town of Breaux Bridge, Mulate's is a good choice for both food and music. There's a dance floor adjacent to the dining room, where dancers twirl between courses while a live band plays. It can be a bit of a tourist trap, but the location is convenient (it's very near the Convention Center, as well as the Julia Street Pier, where cruise ships dock), and the music is to-the-bone Cajun, every night. Lee Benoit & the Bayou Stompers and La Touché are the usual weeknight groups, and the wonderful Jonno & Bayou Deville are usually in on weekends. If you're in the French Quarter with zydeco on your mind, Krazy Korner is your place. This bar is one of the only Bourbon Street venues that still actively and regularly promotes excellent local zydeco, blues, and R&B, and though drinks are overpriced (it's Bourbon Street, after all), it's still a good place to dance away a couple of hours. Dwayne Dopsie & the Zydeco Hellraisers, fronted by one of the sons of the legendary zydeco accordionist and songwriter Rockin' Dopsie, play here several times a week throughout most of the year and are worth checking out. Another French Quarter staple, the Bayou Club specializes in two things: Cajun music and Hand Grenades, an infamous liquor-heavy beverage that… well… let's just say it'll improve your dancing (or so you'll think). There's Cajun (or Cajun-ish) music on the menu every night of the week, though as it's a bit of a Bourbon Street dive, you won't find a heavy local contingent, so if you're looking to find a local dance partner, this isn't the place to do it. Still, it's a reliable place to hear decent Cajun music in the Quarter, so it's worth stopping in. Keep an eye on the schedule for Brandon Moreau and CajunGrass. Moreau is a talented fiddler from the Cajun music hotbed of Evangeline Parish, and he's one to seek out, for sure. Frenchmen Street is the place to go for consistently excellent (and wildly diverse) live music in New Orleans, and Cajun and zydeco are just two of the many genres that you might find at any one of more than a dozen clubs each night. Your most likely suspect, though, is d.b.a. Though they only host Cajun and zydeco bands once a month or so, they really draw the very best: The Lost Bayou Ramblers, Feufollet, The Pine Leaf Boys, and so on. There's enough of a local contingent that you'll see authentic dancing, but overall, d.b.a. attracts a younger crowd than you'll see elsewhere, so if that's what you're looking for, this is the place to go.